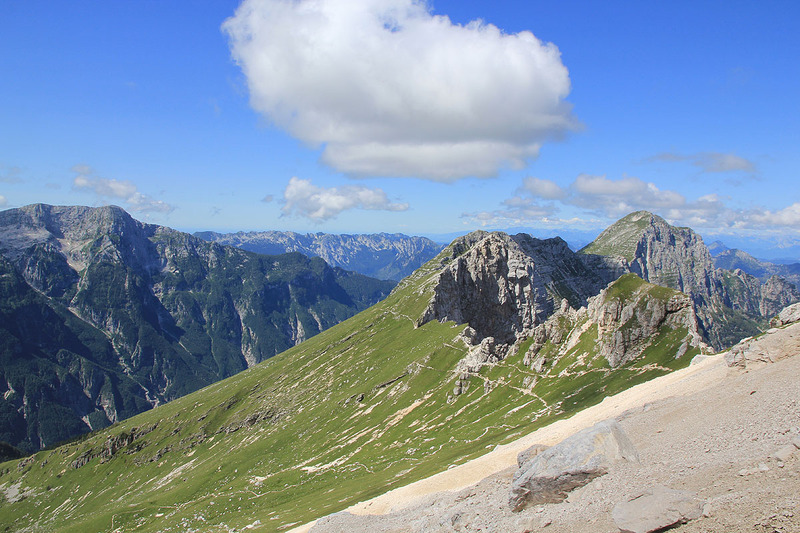 A natural point of reference is the village Tarvisio close to both Austria and Slovenia in North-East Italy. Take SS54 south, then turn right onto SP76 with signs for the ski resort named Sella Nevea. 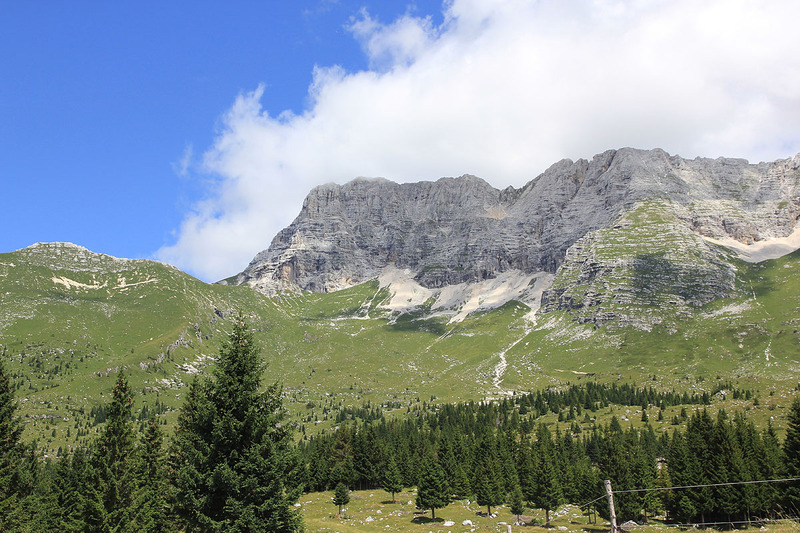 In Sella Nevea, shortly after crossing the col, locate a paved side road that forks right exactly in a sharp left curve on the main highway. (Note this description assumes that you are driving west.) Take this road and drive 6 km. This road is in good condition. You will arrive at a pretty large parking area, park here, this is the trailhead. Location N46:24.573, E013:26.253, elevation about 1505 meter. 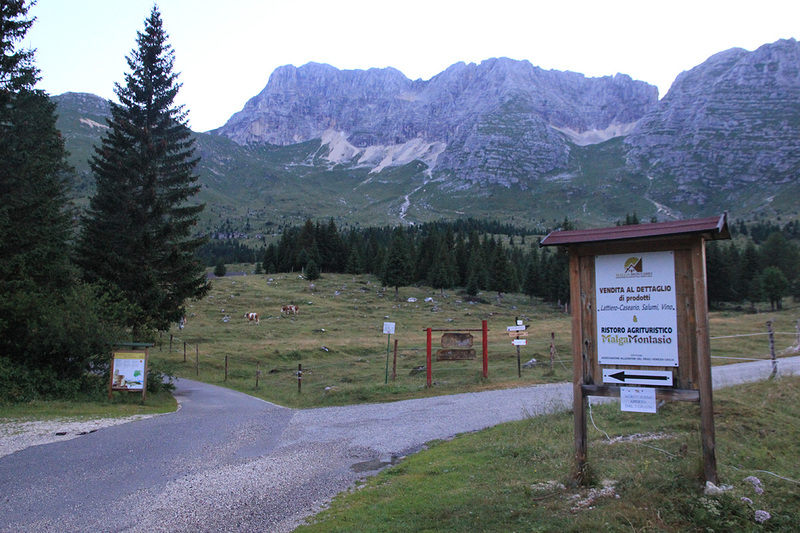 From the parking area, follow the road uphill to Rifugio di Brazza. 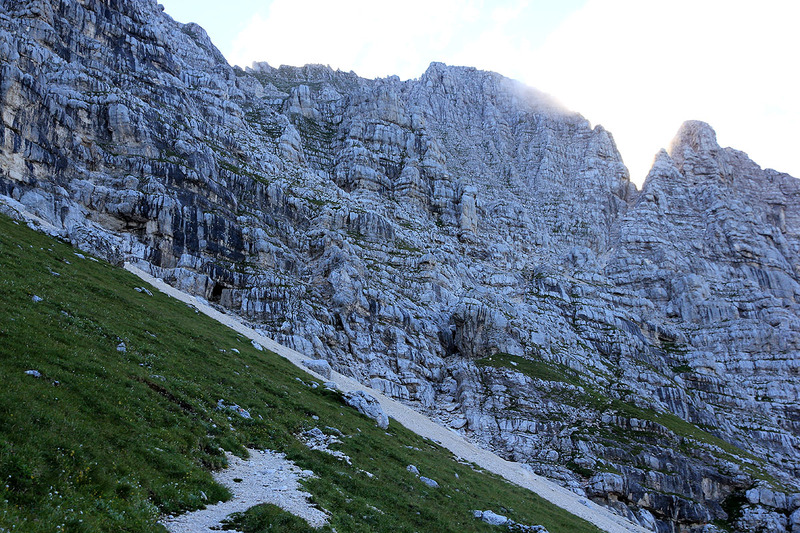 The trail starts as your road gets up behind the rifugio. Shortly, there is an unmarked trail fork, take the left branch. Soon thereafter you will again come to a trail fork, but this one has a sign. Again take the left branch. You can see the summit already from the parking area. 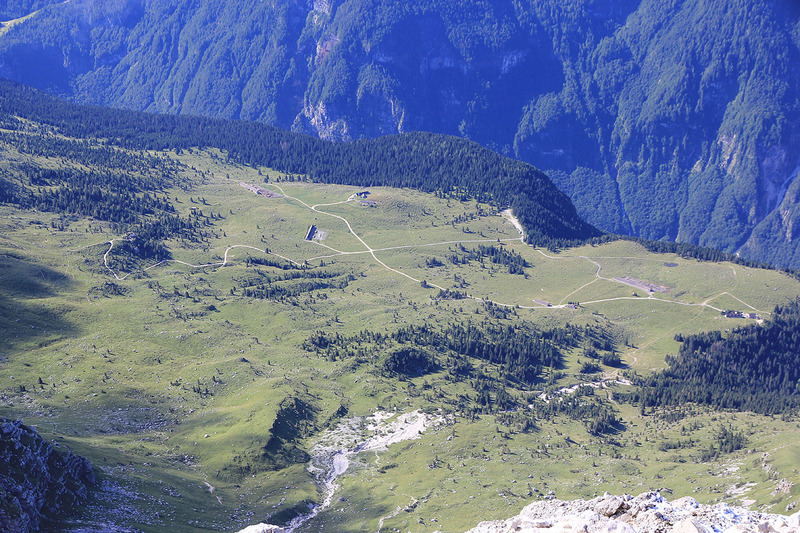 The trail will cross and ascend the large green area below the steep rocl face. 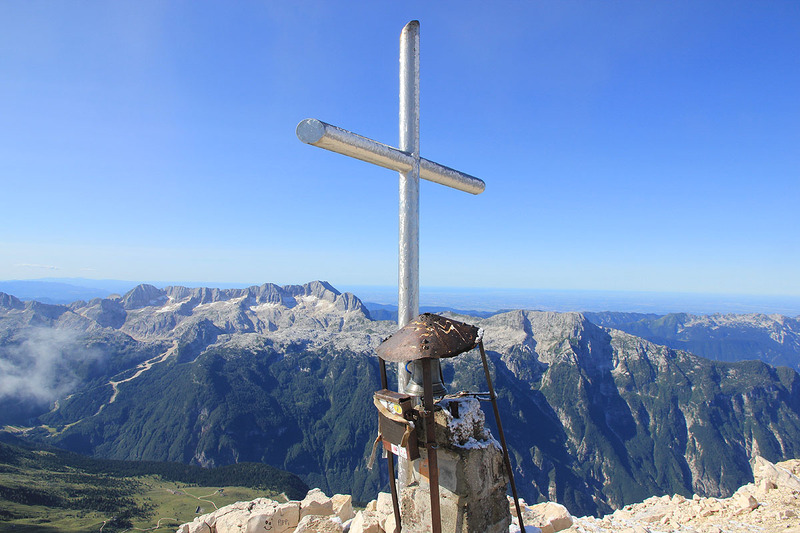 Do stay on the main trail until it reaches a fork at location N46:25.884, E013:26.022, elevation about 2200 meter. Now take the right fork and traverse across scree to the rock. There are some red paint and some unclear red writing on the rock. Follow the main route as it goes right and turns the local rock corner. Continue to follow the route marked with red dots and some red painted lines and arrows. You generally ascend while traversing right (facing uphill). Quite a bit higher, there is a fork. 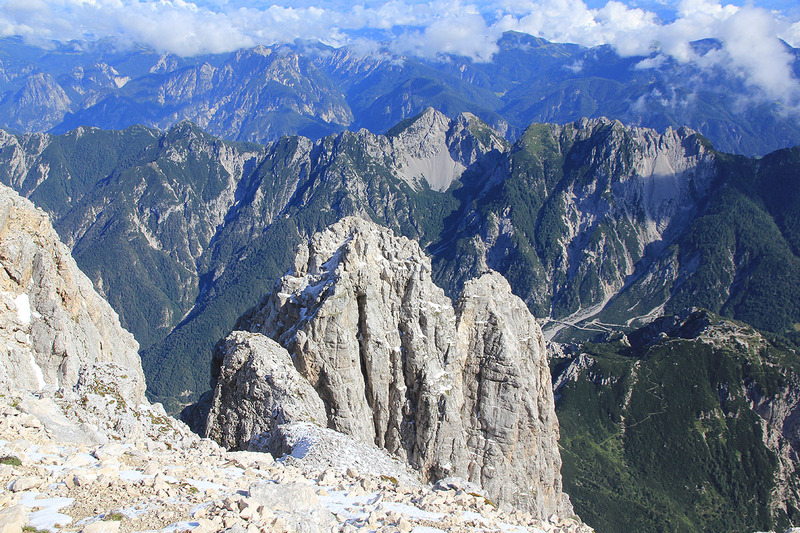 A Via ferrata forks right. There is a painted sign saying "Pipans", pointing left, this is the way to go. From here, the route runs straight uphill on a fairly easy slope that ends just below a characteristic window (hole) in the ridge. 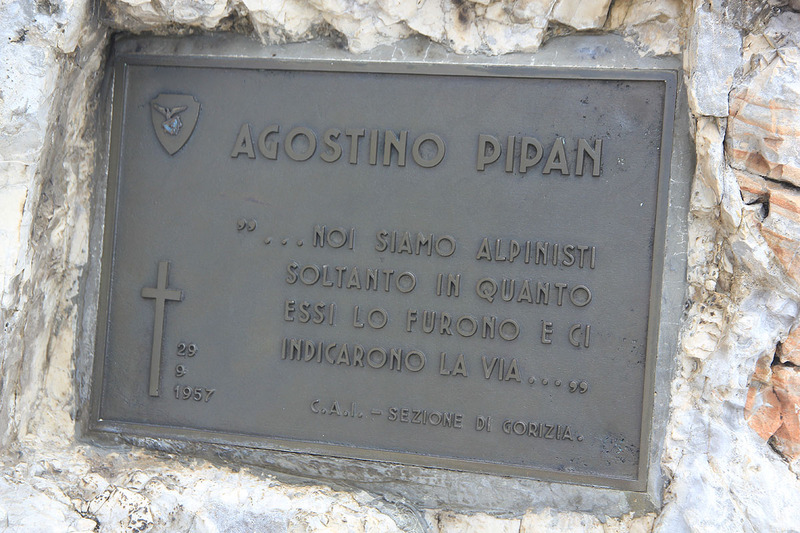 Pipan´s ladder starts up on the left side. The beginning are a few fixed metal steps, soon the real ladder starts. Unlike most ladders, this one is not rigid, more like a rope ladder, but based on steel cables. Thus, it swings a little, but is generally quite stable. 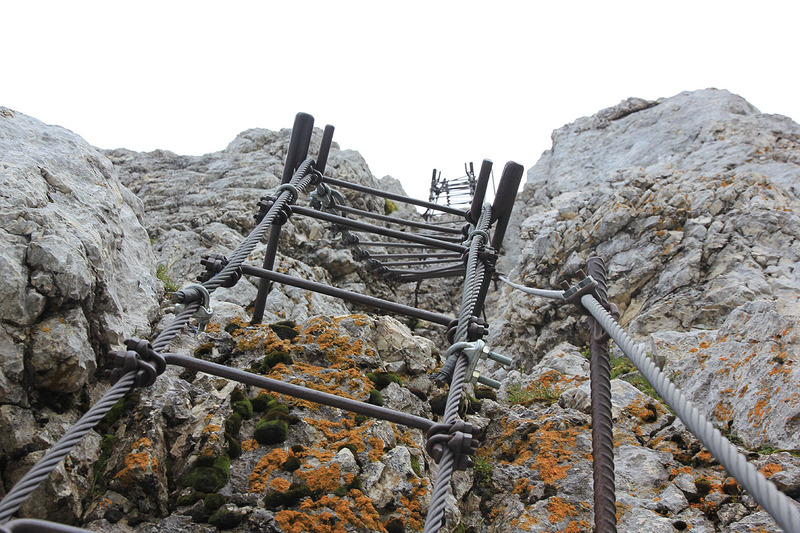 Climb this ladder to the top, from where one easily reach the main crest. 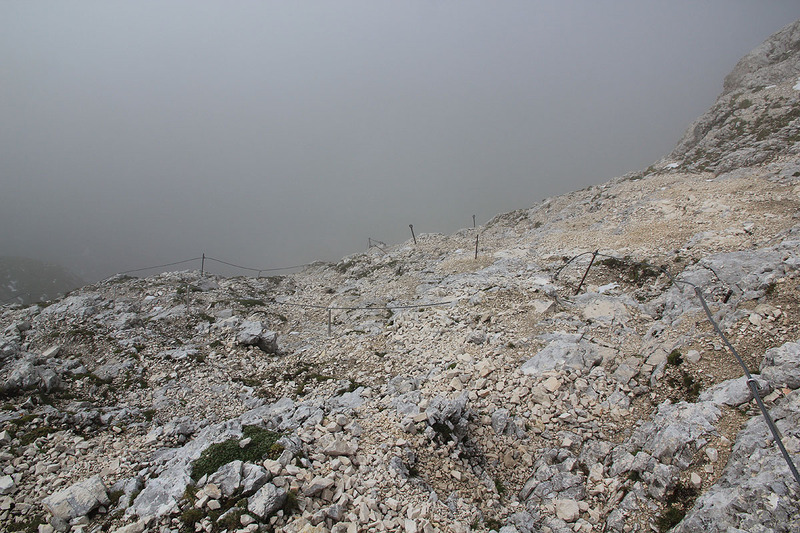 From here, follow the main ridge, first ascending, later more horizontally. The route runs nicely along, sometimes a bit too the left. 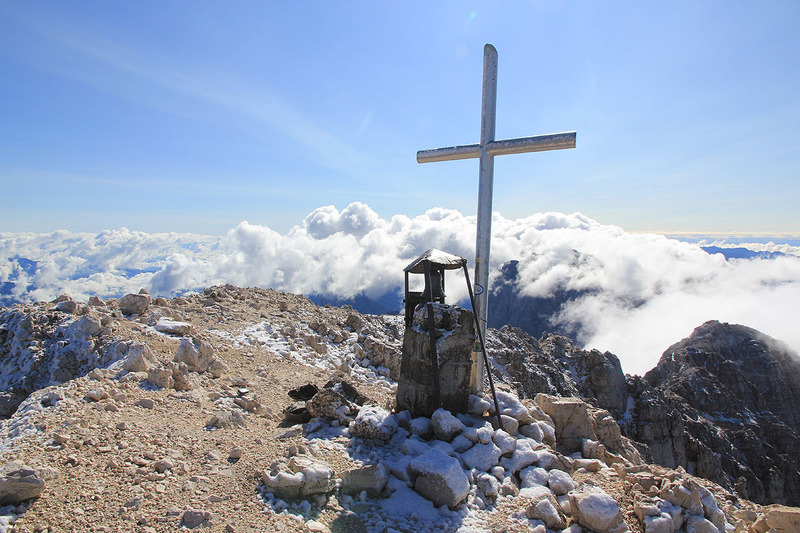 There are no real difficulties and you will arrive at the proper summit with a cross and a bell. 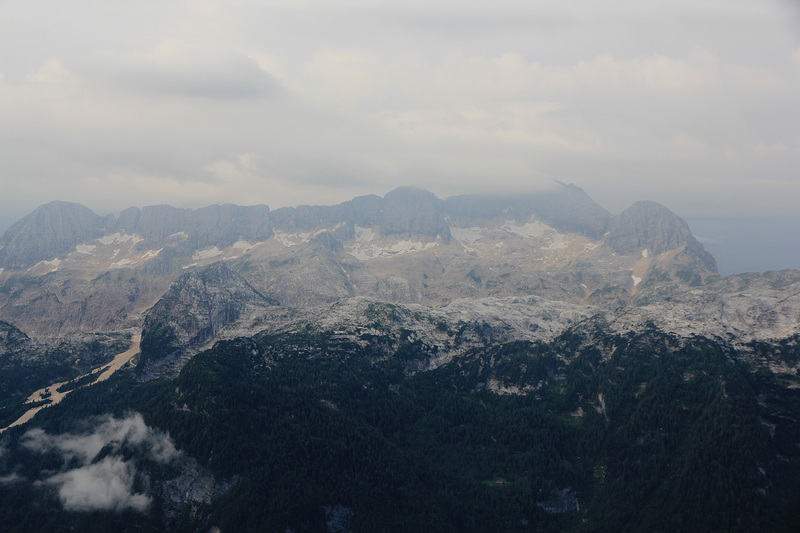 First attempt: We had arrived in Sella Nevea after an efficient, but long drive from Abruzzo. Checked in at one of the ski hotels - Hotel Canin. The next morning, I left early with a clear morning sky above. I quickly drove up to the parking area, arriving there as daylight appeared. The local farmers were moving their cows from one pasture to another. 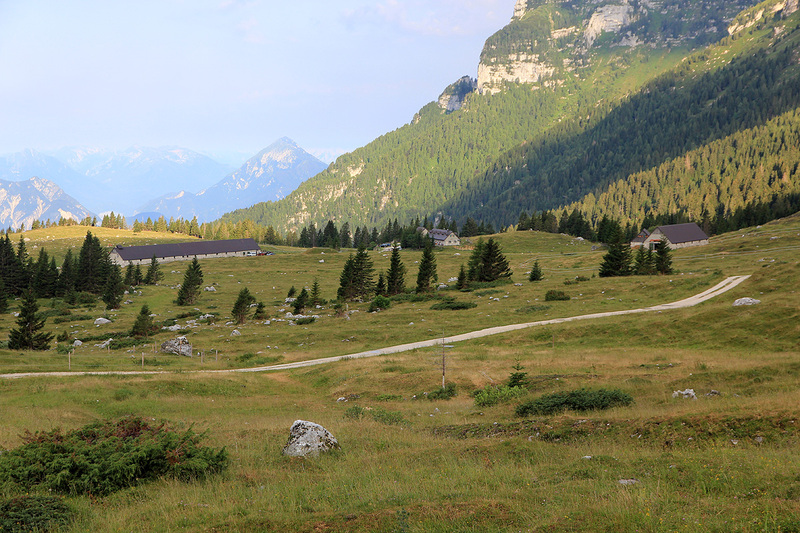 I started up the road towards rifugio di Brazza around 0520 and arrived at the end of the road just behind the hut about 20 minutes later. As I continued on the trail, I noticed the dark clouds to the south, in fact the Canin mountain was already totally engulfed in clouds. Montasio had blue sky overhead. I continued hiking while keeping an eye on the weather. It looked omnious. Before long, there was thunder and lightning across to Canin. Worse, the weather was clearly moving towards me. By 0630, I had reached location N46:25.659, E013:26.056, a little more than 2000 meter of elevation. Jôf de Montasio was now in a cloud and the dark clouds further south did not show any signs of improvement. It seemed clear that I would have rain at any moment. Time for some decisions. I could sit down and wait, to see if this weather would move through. I could turn around and descend. It was pretty clear that going much higher would be unwise as I would be exposed to a likely thunderstorm without an easy escape. After some reflection, I decidee to descend. I spotted an interesting animal on the way down. 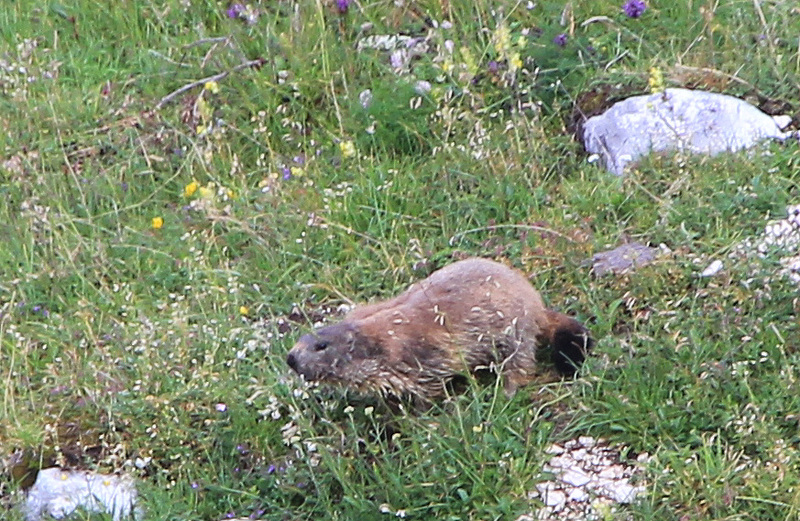 It first looked like a small fox, then more like a large marmut (do they exist here?). I quickly got back down to the more gentle farmers fields, a very nice, cultivated landscape. It turned out (with hindsight!) that I most likely could have waited and then ascended without any thunder. It would not have been a great day for climbing, but doable. Since I acted differently, I was back at the hotel by 0800, the weatherforecast for this region looked bad for several days and we decided to move west in search for better weather. This took us to Lake Garda where we spent the next 4 nights enjoying good, summer weather. 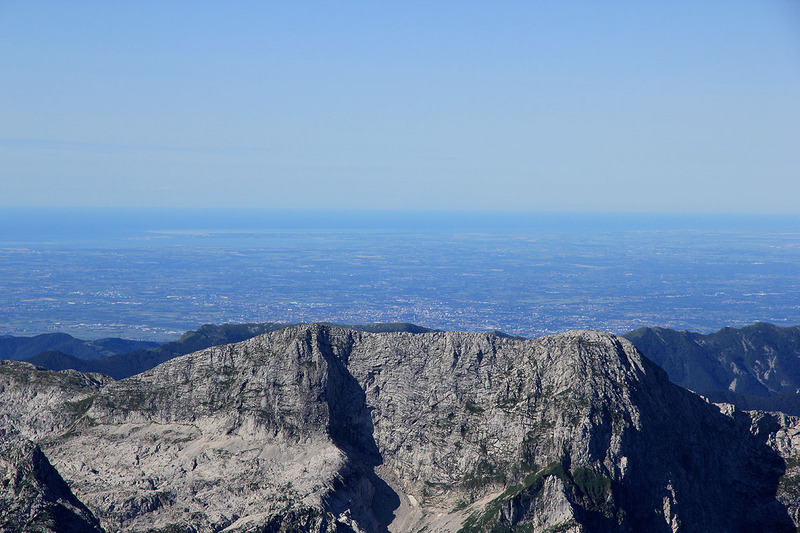 Moving onwards from Lake Garda with better forecasts for the mountains, our plan had been to make an attempt (2 days) on Monte Antelado. 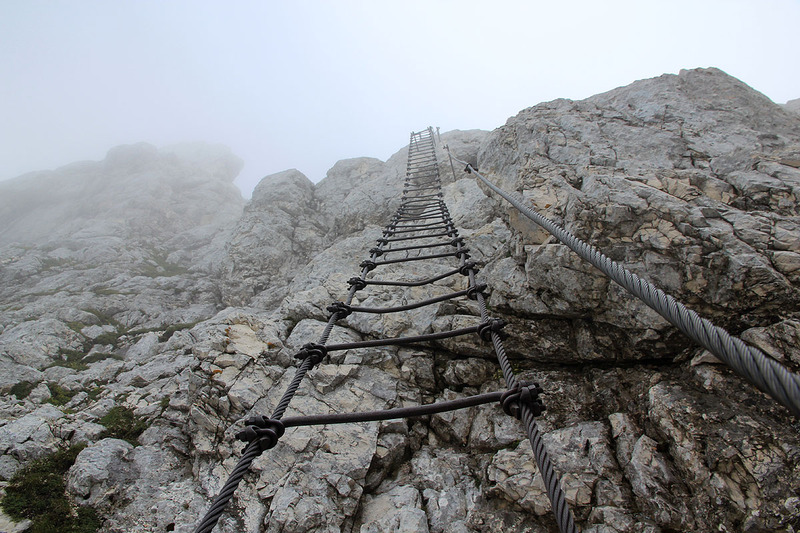 However, as we arrived in the village of San Vito di Cadore, I had second thoughts about my plan. We had lunch and considered the conditions. The last several days had brought plenty of new snow to the higher slopes of the peak, this was clearly visible. 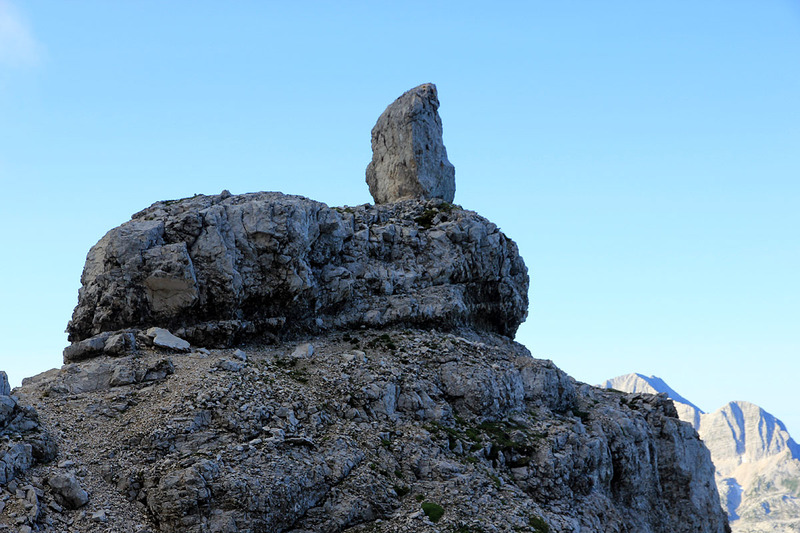 My information about this peak advised that one should have dry conditions. 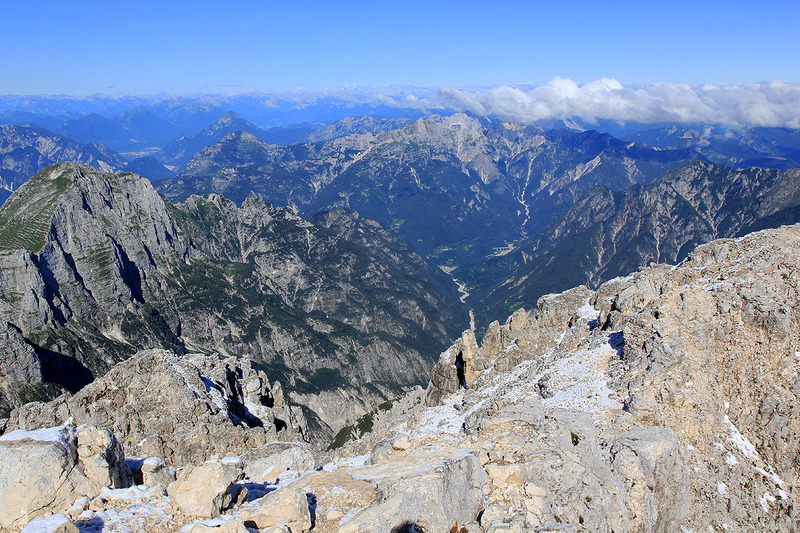 We therefore decided to move on to the town of Tarvisio for a second attempt on Jôf de Montasio. 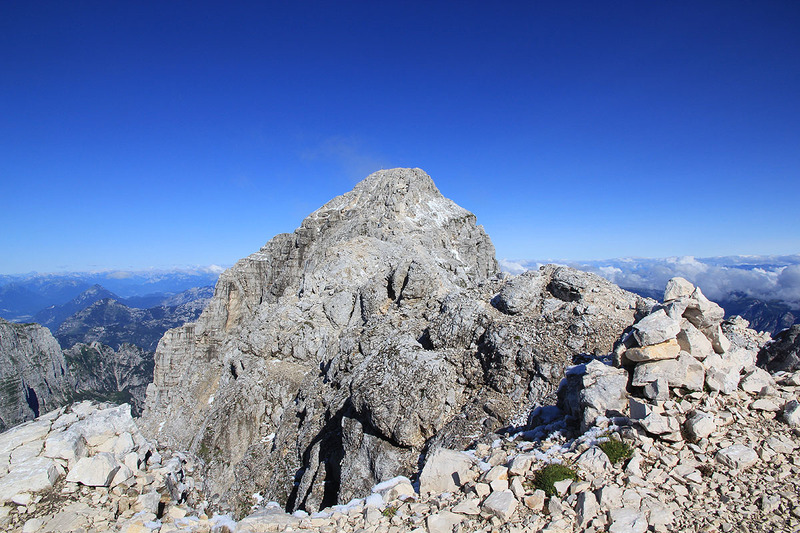 I left our hotel in Tarvisio (a much better place for Heidi than Sella Nevea) early, since I now had about 30 minutes of drive to Sella Nevea. As I turned right about half way, some potential trouble surfaced. The road had a "do not entry sign" and a second sign saying closed. Totally unexpected, I decided to ignore these signs and drive further. Shortly, a new sign warned me that there would be a barrier ahead. Sure enough, a yellow blinking light and a red and white "fence" across the road. 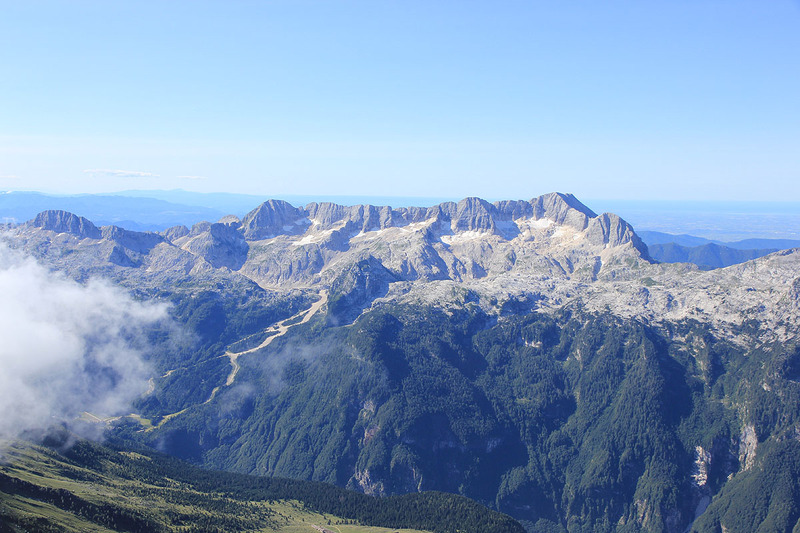 To drive around and access Sella Nevea from the other side was of course possible, but a major detour. My climbing would be severely delayed. What now? There was no appearent reason for this closure, neither any signs of human activity. Looking closer, it seemed like I could drive my car around this barrier and proceed at the other side. However, it would be hard to argue that one had not seen the road closure.. 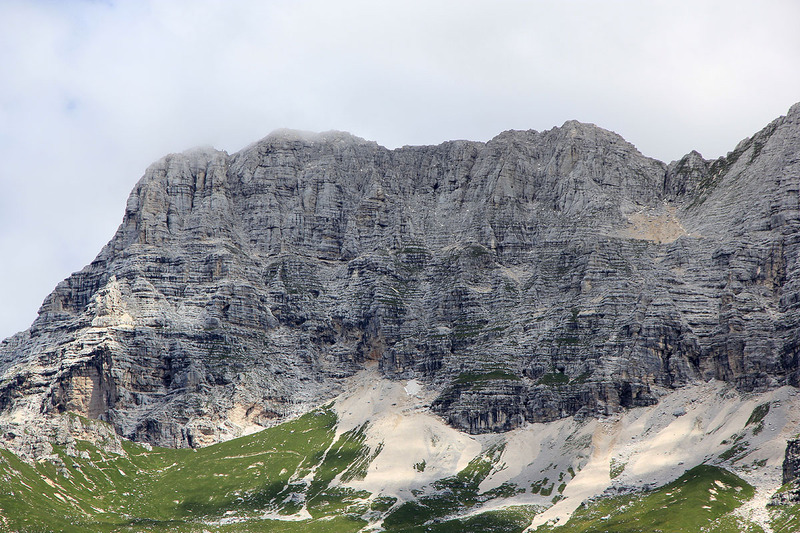 I decided to give it a try, the road was perfectly fine, I saw no sign of any damage nor people and parked at the trailhead below rifugio di Brazza at 0510. A quick breakfast and i was on my way at 0520. 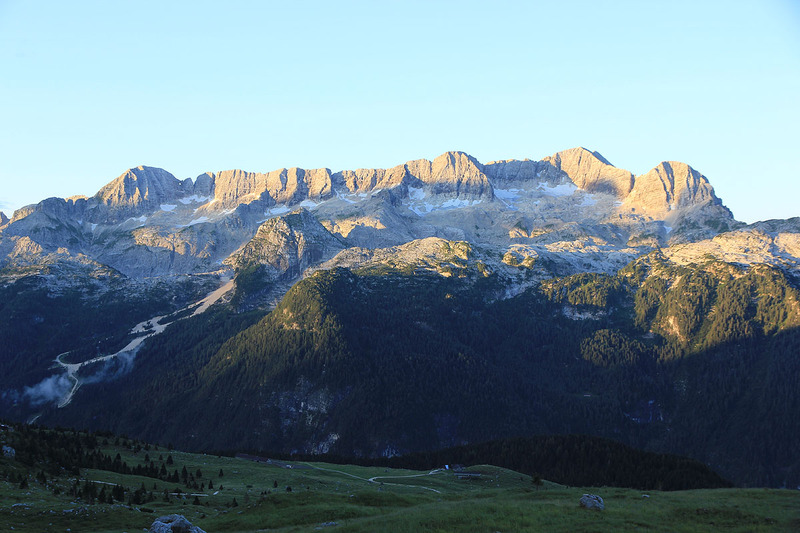 The weather was just superb, the Canin mountains glowing as the sun was about to rise.. The hike to 2200 meter went smoothly, at this point I was slightly uncertain about the route. 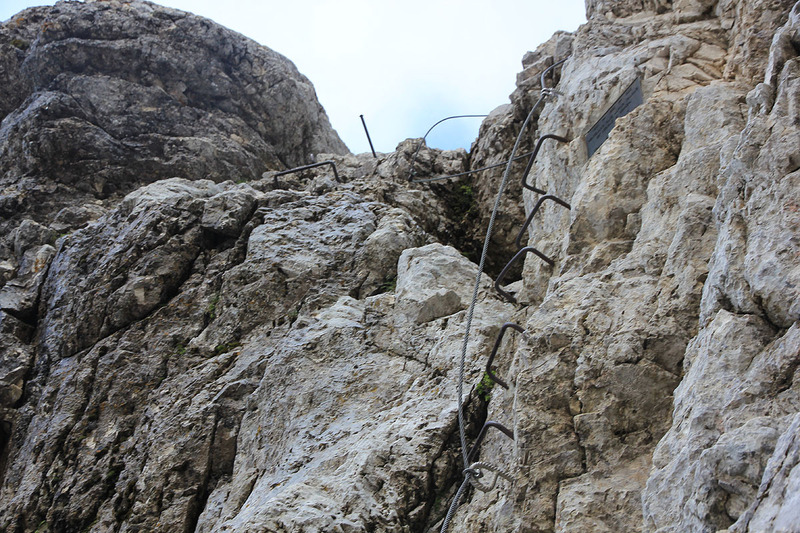 I knew that a via ferrata would head right, but if it forked here or higher was unclear. Since there only seemed to be one way, I took the trail that traversed right on the first part of the lower rock. This route ascended and was obviously correct. 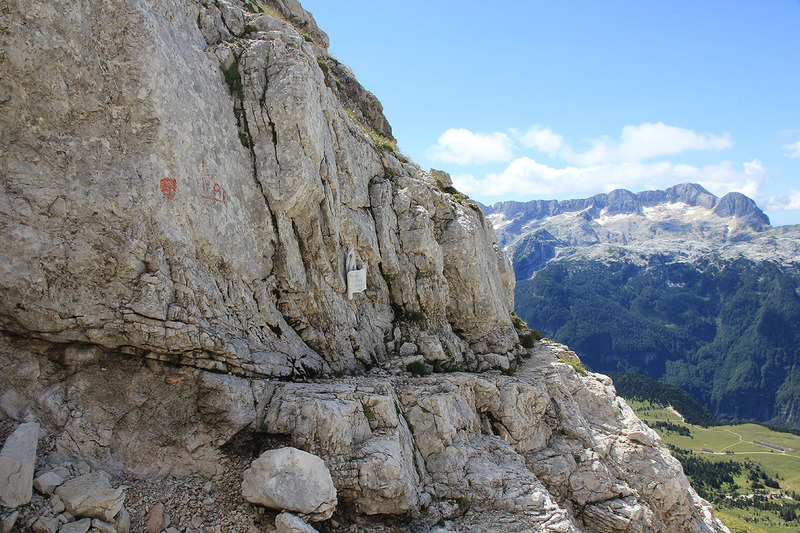 Higher up, where the view was getting increasingly better, the via ferrata forked right, while a painted sign on the rock going more uphill and slightly left said "Pipans". OK, proceed up here. There was snow making things slightly more slippery, but no big deal. 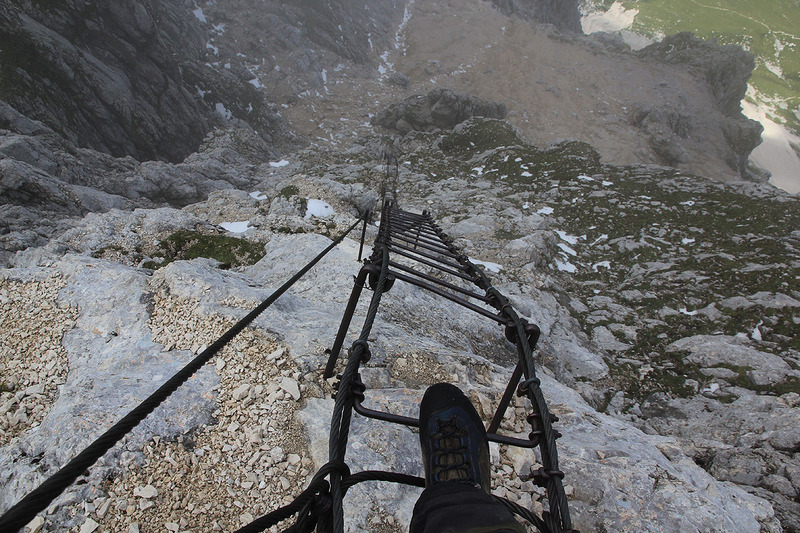 I soon arrived at the bottom of the famous Pipans ladder. I knew there was a bypass route to the right, but with the snow and no clear signs of this alternative, I opted for the ladder. A rather interesting design as it would flex/swing since the vertical part consisted of wires with fixed, iron bars across to step on. 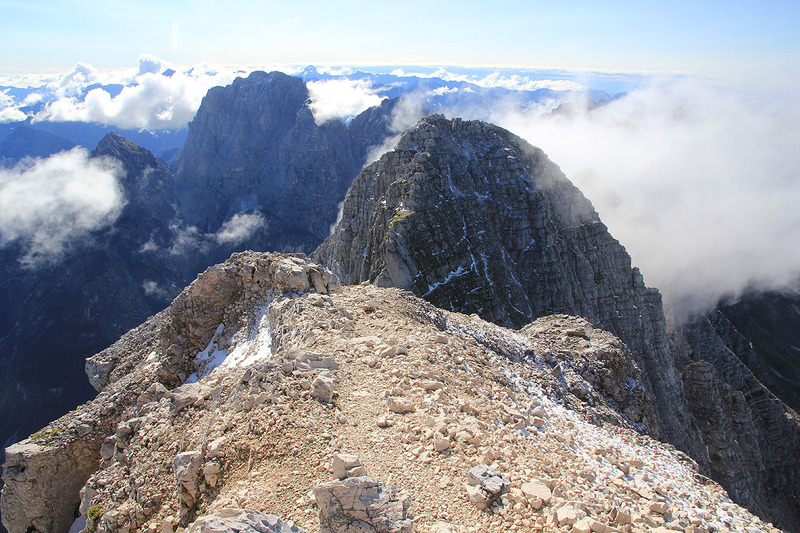 I quickly advanced to the top and thus made the main ridge. 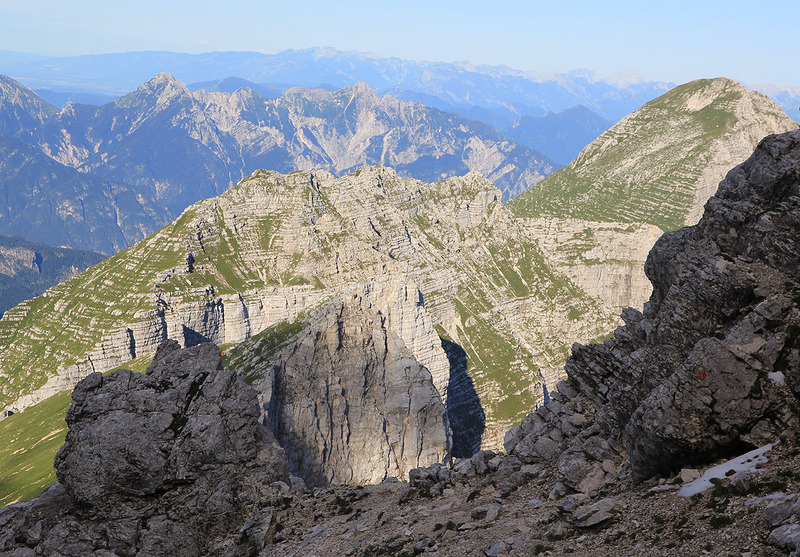 From here, the route is unprotected with some exposure, but generally following a nice trail. Again, the snow that were present as scattered patches, dictated some extra caution in a few places. I arrived at the summit at 0910 after a very enjoyable ridge walk. The weather was nice, but scattered clouds prevented any panorama views. However, the view towards the coast was pretty good, possibly all the way to the sea. I stayed around for 15 minutes before retracing my steps along the ridge. 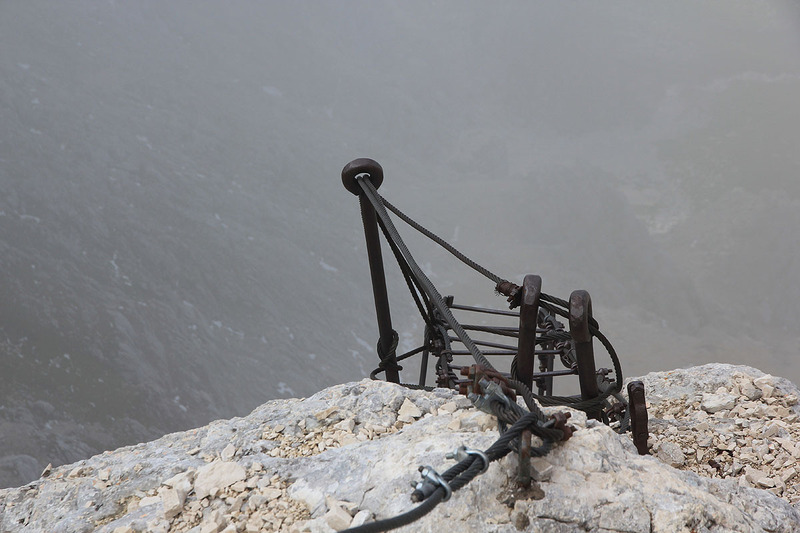 The slope approaching the top of the ladder has lots of loose rocks, care is needed in order not to send rocks on people that may be ascending the ladder. In any event, a helmet is strongly recommended on this route. I took a bit more time on the ladder, keeping my camera outside my backpack in order to document this unusual section a bit better. I was off the climbing part of the route by 1100, then enjoying the more gentle landscape, before returning to my car at 1205. Jôf de Montasio, as seen from the trailhead area. 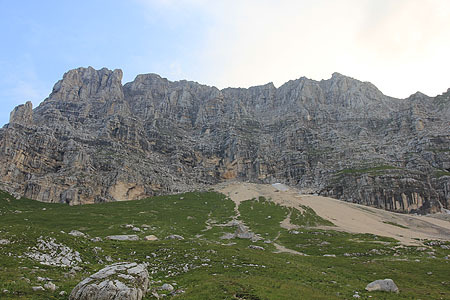 The route ascends right from near the patch of snow, then up along the right side of the scree slope. 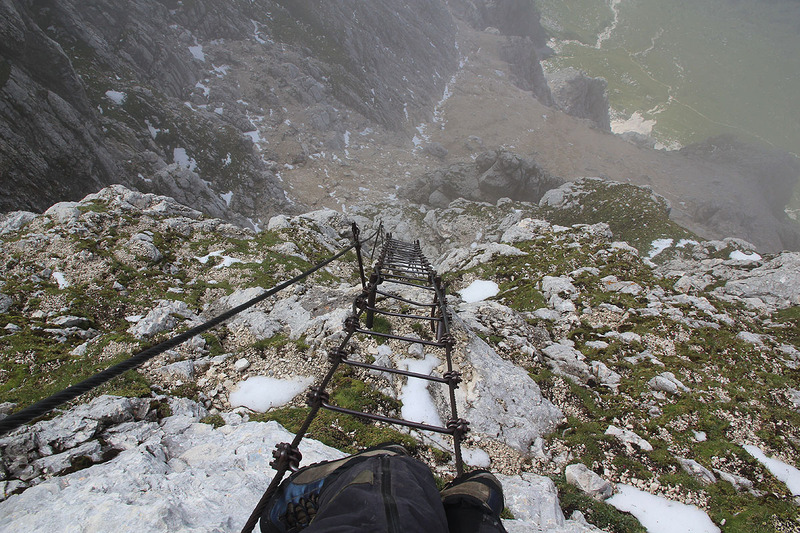 Finally, Pipan's ladder ascends immediately to the left of the very distinct vertical crack near the top ridge. 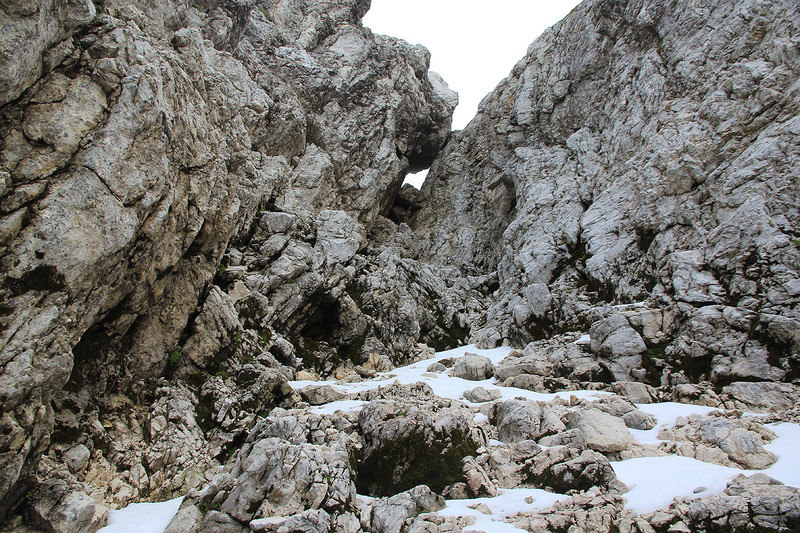 Broken landscape, while ascending the lower part. The main ridge, care is needed! 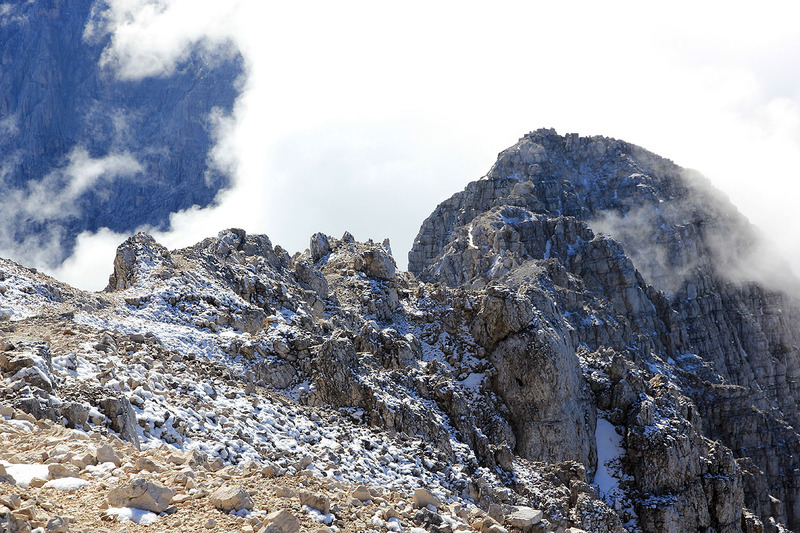 Returning along the ridge, Pipan's ladder is to the right before the local col.